A real Grand Prix will be held for the first time in central Paris on 23 April. Tickets circuit size, we told you that first Paris Grand Prix Formula E, the 100% electric discipline. Formula E arrives in Paris on April 23 for a Grand Prix landmark. This will be a first since the Liberation and September 1945. And even then, the cutting Paris had taken place in the Bois de Boulogne ... This time, real race cars will ignite the streets of Paris during ' a real Grand Prix. No worries however for the ears of the Parisians, it will not shrill buzz of the old F1 or raucous noise of the new F1 hybrid engines driven by Lewis Hamilton, Fernando Alonso and Romain Grosjean but a slight feulement, the electrical engines 100%. Introduced in 2014, the electric Formula quickly won the heart of cities. After London, Beijing or Berlin, it was in Paris to discover this new discipline that has quickly gained its spectacular sport stripes with sometimes daring overtaking on street circuits ... sometimes very narrow! Formula E offers beautiful battle with cars capable of reaching 0-100 km / h in three seconds and the hands of many former Formula 1 drivers from former champions son are also part as Nelson Piquet Junior or Nicolas Prost while Senna will attempt to honor the memory of his uncle. The Renault, Audi and DS committed under their names. Dramatic, revolutionary, Formula E is now preparing to conquer France in 2016! Paris circuit Formula E: where, what turns around the Invalides? Formula E, what is it? See the cars roll into the streets of Paris will be worth the look, especially as the circuit promises pretty pictures. 2 km long, the temporary circuit will indeed installed in the heart of the capital, in the famous district of the Invalides, close to the Hotel of the same name whose dome houses the tomb of Napoleon. Date, tickets, tour but teams and drivers, we told you all about this sporting landmark event in 2016. Drivers, committed teams, races format schedules, it explains everything on this Form E promises to shake Paris ! Unlike a Formula 1 Grand Prix, a Formula E Grand Prix is ​​held on a single day, against three for F1 (free practice on Friday, qualifying on Saturday and race on Sunday). Formula E, the race follows a few hours the qualifying session. The Invalides district will therefore curly one day, Saturday, April 23. Traffic will be cut to 6 am before the start of free practice at 8:15. Then find the drivers for the qualifying session for composing the noon starting grid for an hour and fifteen minutes hunting chrono (from 12h to 13h 15 so). The race start is scheduled at 16 hours, a 45-minute format. Circuit de Paris: where, what plot? The circuit will be drawn in the middle of Paris, in the Invalides area in 6earrondissement. Several sites were considered: around the Grand Palais, Place de la Nation or the Reuilly but the Invalides had many benefits in terms of traffic but also the background, providing a stunning backdrop for the race. 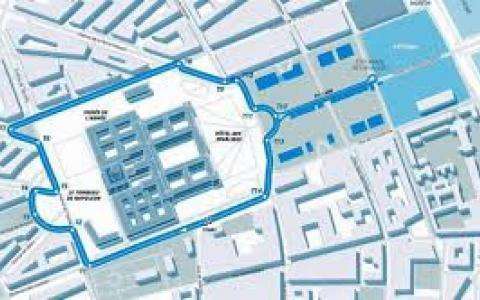 The circuit measuring 1.93 km in 14 turns placed around the Hotel des Invalides. The starting line will be installed under the trees of Boulevard des Invalides before borrowing the avenue Tourville, Place Vauban, Boulevard de la Tour Maubourg and Grenelle Avenue. The stands will be placed on the Place des Invalides or village will be open for free access.